Ontonagon Michigan - Lodging, Hiking, Camping, Snowmobiling, and the Porcupine Mountains. Snowmobile the Ontonagon area in the Winter, explore the Lake Superior Shorelines and see the views from the Porcupine Mountains! The Porcupine Mountains offers year round vacation fun such as snowmobiling, charter fishing, sight seeing, hiking, boating, and camping. 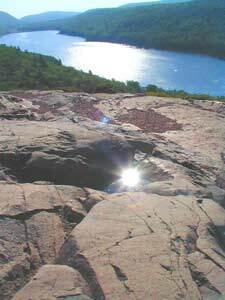 The area boasts its remote location the, its rocky Lake Superior Shoreline and the picturesque views from the Porcupine Mountains. Plenty of Wonderful Lodging in the Ontonagon area! Visit our Ontonagon area Hotels (Check for our many new Hotels) and Motels on the Lake and Shore! Centered in the Upper Peninsula - this location is surrounded by great activities and sights to see! The Lake Superior Lakeshore, views from the Porcupine Mountains, Hiking, Lodging, Camping, Exploring, and more in Ontonagon County! Explore the Ontonagon Michigan area and experience the unique remote surroundings and diverse landscape of the Upper Peninsula. From the top of the Porcupine Mountains (shown on the right) to the lower sandy shores of Silver City to downtown Ontonagon, enjoy these pristine and unique wonders of nature! In Ontonagon County the Lake Superior Shoreline is fun for boating, canoeing, and fishing. The Porcupine Mountains offer miles of hiking trails in the summer and cross country trails in the winter. The Porcupine Mountains are home to around 60 waterfalls.. Check in at the Michigan D.N.R. headquarters for maps and detailed information on what the Porcupine Mountains Wilderness State Park has to offer. Click ads below to view our Ontonagon Area "Superior Ad" sponsor websites. Click here for information on how you can become a Superior Ad Sponsor. Click Here >>Link with us just $50 / year and feature your Hotel, Motel, & other Lodging with us! ©Copyright 2002 Superior Sights and Velvet Green Creations - All Photos, Web Pages, Text, Animations, Layout & Design may not be copied in any form without the written and expressed consent of Velvet Green Creations. Flash Animation,Web Sites, Web Design Components for other Designers and More! See our Featured Web Sites. Website Design by Velvet Green Creations Web Design Services. Creating great e-masterpieces. Visit us online at: www.velvetgreencreations.com - Fine Art and Web Design. Velvet Green Creations and Superior Sights are not responsible for third party web site lodging reservations, third party content, safety and maintenance of any web sites linked from our pages. We are also not responsible for third party web site content that may include: copyrighted material, inappropriate content, or outward links to ininappropriate content.